Peacocks are some of the most widely recognized birds in the world, due to their beautiful blue-green plumage and spotted tail feathers, which fold open into an elaborate fan. These birds are about more than their feathers, though, and not many people know much about the birds and how they live or interact. Peacocks are actually the males of a species called peafowl, which are native to Asian forests. Peafowl are a type of pheasant and are capable of flight. Female peafowl, called peahens, have brown feathers and shorter tails, which camouflage them and help them fly more easily than males. 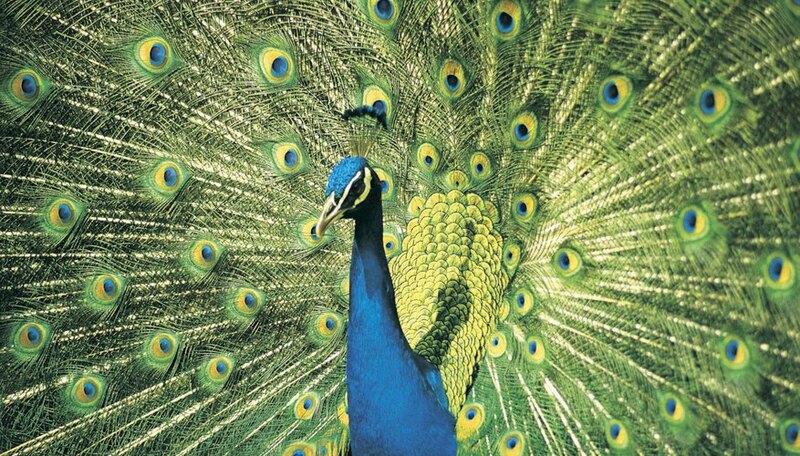 Peacocks unfold their tail feathers in order to impress females, though most of their displays go ignored. Peacocks, or peafowl, as the word "peacock" only refers to the male of the species, are commonly seen in zoos, on ranches and on hobby farms in the United States and in Europe. However, peacocks are originally native to the forests of Asia. These birds are members of the pheasant family, and they exhibit many of the same behaviors as other pheasants. They are ground feeders, meaning that they spend most of the time searching for food on the ground. They tend to live in forested areas and will hide in tall grass or shrubbery to escape predators. In spite of their large size, peacocks are capable of flight. In fact, they are one of the largest and heaviest flying birds in the world. If a peacock is startled, it may fly to escape danger, though it cannot stay in the air for extended periods of time due to its weight. Female peafowl are known as peahens. Unlike their male counterparts, female peahens do not have bright, flashy plumage. Their feathers are mostly brown, except for their cream-colored bellies and greenish-blue throats. Their tails are much shorter than males, and though they can still unfold them into a fan, their feathers are not brightly colored and do not have the "eye" spots for which peacock tails are so famous. Though peahens may not be as pretty as peacocks, they do have one great advantage over the males of the species: their flying ability. Because peahens do not have those long, voluminous tails to weigh them down, they are much better fliers than peacocks. This means they can escape predators more easily than males. A peahen's brown feathers also help her blend into her environment more readily than a peacock can. This comes in handy during breeding season, when female peahens must stay atop their nest for long periods of time. Without the camouflage her feathers provide, a peahen would be much more vulnerable while nesting. Pictures of peacocks commonly show the birds with their tail feathers spread. These tail-feather fans are part of the way peacocks attract mates. Many bird species engage in courtship rituals; in these rituals, when a male and female find each other, one or both of them puts on some sort of display. This often involves displaying plumage and performing some type of "dance," or a specific set of movements. In some bird species, a male and female will perform a courtship ritual together. It is thought that this type of ritual helps create a social bond between the newly mated pair. In other bird species, only one bird – usually the male – displays. Such is the case with peacocks. When a male peacock finds a peahen that he hopes to mate with, he first unfolds his tail feathers. Often he will step into the peahen's path, to make his presence obvious. He then begins to shiver, causing his feathers to move rapidly back and forth. This reflects light off of the highly iridescent feathers, making him seem even more brightly colored. If the peahen is impressed with his display, she will approach and mimic his movements for a few moments, before mating with him. However, most peacock displays end up being rejected by peahens, who seem to be highly picky. It is believed that peahens try to select a male with the brightest plumage possible because it is a sign of good health, which is a sign of good genetics. It stands to reason that if a female chooses a strong, healthy mate, her chicks will have a genetic advantage and be more likely to survive to adulthood. Cook, Maria. "Characteristics of a Peacock Bird." Sciencing, https://sciencing.com/characteristics-peacock-bird-6155098.html. 19 April 2018.